Raymond Nicolas Landry Poincaré (French pronunciation: ​[ʁɛmɔ̃ pwɛ̃kaʁe]; 20 August 1860 – 15 October 1934) was a French statesman who served three times as 58th Prime Minister of France, and as President of France from 1913 to 1920. He was a conservative leader, primarily committed to political and social stability. Trained in law, Poincaré was elected as a Deputy in 1887 and served in the cabinets of Dupuy and Ribot. In 1902, he co-founded the Democratic Republican Alliance, the most important centre-right party under the Third Republic, becoming Prime Minister in 1912 and serving as President of the Republic for 1913-20. He attempted to wield influence from what was normally a figurehead role, being noted for his strongly anti-German attitudes, visiting Russia in 1912 and 1914 to repair Franco-Russian relations, which had become strained over the Bosnian Crisis of 1908 and the Agadir Crisis of 1911, and playing an important role in the July Crisis of 1914. From 1917, he exercised less influence as his political rival Georges Clemenceau had become Prime Minister. At the Paris Peace Conference, he favoured Allied occupation of the Rhineland. In 1922 Poincaré returned to power as Prime Minister. In 1923 he ordered the Occupation of the Ruhr to enforce payment of German reparations. By this time Poincaré was seen, especially in the English-speaking world, as an aggressive figure (Poincaré-la-Guerre) who had helped to cause the war in 1914 and who now favoured punitive anti-German policies. His government was defeated by the Cartel des Gauches at the elections of 1924. He served a third term as Prime Minister in 1926-9. Born in Bar-le-Duc, Meuse, France, Raymond Poincaré was the son of Nanine Marie Ficatier, who was deeply religious  and Nicolas Antonin Hélène Poincaré, a distinguished civil servant and meteorologist. Raymond was also the cousin of Henri Poincaré, the famous mathematician. Educated at the University of Paris, Raymond was called to the Paris Bar, and was for some time law editor of the Voltaire. He became at the age of 20 the youngest lawyer in France. and was appointed Secrétaire de la Conférence du Barreau de Paris. As a lawyer, he successfully defended Jules Verne in a libel suit presented against the famous author by the chemist, Eugène Turpin, inventor of the explosive melinite, who claimed that the "mad scientist" character in Verne's book Facing the Flag was based on him. At the age of 26, Poincaré was elected to the Chamber of Deputies, making him the youngest deputy in the chamber. Poincaré had served for over a year in the Department of Agriculture when in 1887 he was elected deputy for the Meuse département. He made a great reputation in the Chamber as an economist, and sat on the budget commissions of 1890–1891 and 1892. He was minister of education, fine arts and religion in the first cabinet (April – November 1893) of Charles Dupuy, and minister of finance in the second and third (May 1894 – January 1895). In Alexandre Ribot's cabinet, Poincaré became minister of public instruction. Although he was excluded from the Radical cabinet which followed, the revised scheme of death duties proposed by the new ministry was based upon his proposals of the previous year. He became vice-president of the chamber in the autumn of 1895 and, in spite of the bitter hostility of the Radicals, retained his position in 1896 and 1897. Along with other followers of "Opportunist" Léon Gambetta, Poincaré founded the Democratic Republican Alliance (ARD) in 1902, which became the most important centre-right party under the Third Republic. In 1906, he returned to the ministry of finance in the short-lived Sarrien ministry. Poincaré had retained his practice at the Bar during his political career, and he published several volumes of essays on literary and political subjects. "Poincarism" was a political movement over the period 1902–20. In 1902, the term was used by Georges Clemenceau to define a young generation of conservative politicians who had lost the idealism of the founders of the republic. After 1911, the term was used to mean "national renewal" when faced with the German threat. After the First World War, "Poincarism" refers to his support of business and financial interests. Poincaré was noted for his lifelong feud with Georges Clemenceau. Poincaré became Prime Minister in January 1912, and began a policy meant to block Germany's ambitions for "world power status", and worked to restore ties with France's ally, Russia. During the Bosnian Crisis of 1908-1909 and the Second Moroccan Crisis in 1911, Russia and France had failed to support each other. In August 1912, Poincaré visited Russia to meet Tsar Nicholas in order to strengthen diplomatic ties. Poincaré believed the rapprochement would deter Germany from risking a demarche to war, and thus avoid a repeat of the Second Moroccan crisis. 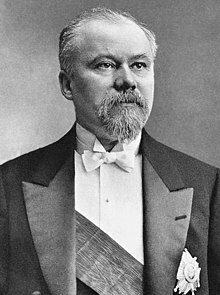 Tsarist Russia, despite its Francophilia, was generally disdainful of most of the leaders of the Third Republic, but Poincaré was an exception, regarded in St. Petersburg as a strong leader who meant what he said. Poincaré hoped to pursue an expansionist policy at the expense of the Germany's unofficial ally, the Ottoman Empire. Poincaré was a leading member of the Comité de l'Orient, the main group that advocated French expansionism in the Middle East. Poincaré's willingness to begin a rapprochement with Imperial Germany in order to allow France to pursue its ambitions in the Middle East was strengthened by the outcome of the First Balkan War, where Bulgaria - whose army had been trained by a French military mission - rapidly defeated the Sultan's army - whose forces had been trained by the German military. Bulgaria's swift victory over the Ottomans was a great blow to German prestige, and correspondingly boosted French confidence. Poincaré rejected Joseph Caillaux's proposal for a Franco-German alliance, arguing that Paris would be the junior partner, thus tantamount to ending France's status as a great power. By contrast, the Treaty powers known as the Triple Entente being between two more or less equal powers, would preserve the current status quo ante bellum. Poincaré's foreign policy was to maintain France as a great power in face of Germany's demands for Weltpolitik ("World politics") under which the Germany sought to become the world's dominant power. He wanted to strengthen both France and Russia to such a point that they presented such a decisive margin of superiority as to deter Germany from going to war with either power, but at same time his foreign policy was not relentlessly anti-German, as he was prepared to improve Franco-German relations on specific issues. A fiscal conservative, Poincaré was deeply concerned about the financial effects of an ever more costly arms race. Being from Lorraine, whether he was a revancharde (revanchist) is disputed. His family house was requisitioned for three years during the war. Le Petit Journal announces the election of Poincaré (1913). 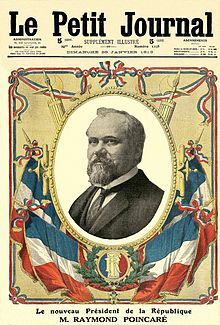 Poincaré won election as President of the Republic in 1913, in succession to Armand Fallières. The strong-willed Poincaré was the first president of the Third Republic since MacMahon in the 1870s to attempt to make that office into a site of power rather than an empty ceremonial role. He asserted his personality and took a special interest in foreign policy. On 20 January 1914, he became the first French president to visit the German embassy in Paris, a gesture clearly meant to show that he wanted to continue a policy of trying to improve German understanding of French aims. On 28 June 1914, Poincaré was at the Longchamps racetrack when he received news of the assassination of the Archduke Franz Ferdinand in Sarajevo. The President remarked that the assassination was a tragedy, ordered an aide to draft a message of condolence to the people of Austria-Hungary and stayed on to enjoy the rest of the races. In 1913, it had been announced that Poincaré would visit St. Petersburg in July 1914 to meet Tsar Nicholas II. The Austro-Hungarian Foreign Minister, Count Leopold von Berchtold, decided it was too dangerous for Austria-Hungary to present its ultimatum to Serbia while the Franco-Russian summit was in progress and decided to wait until Poincaré was on board the battleship France that would take him home. Accompanied by Premier René Viviani, Poincaré went to Russia for the second time (but for the first time as president) to reinforce the Franco-Russian Alliance. The transcripts of the St. Petersburg summit have been lost, but the surviving documentary evidence suggests that neither Nicholas nor Poincaré were particularly concerned about the situation in the Balkans. At the time of the St. Petersburg summit, there were rumours, but little hard evidence, that Vienna might use the assassination to start a war with Serbia. Poincaré's attempts to communicate with Paris were blocked by the Germans who jammed the radio messages between his ship and Paris. in the precautionary measures and defensive measures to which Russia believes herself obliged to resort, she should not immediately proceed to any measure which might offer Germany a pretext for a total or partial mobilization of her forces. Additionally, orders were given for French forces to pull back six miles from the frontier with Germany. The next day, 31 July, the German ambassador in Paris, Count Wilhelm von Schoen, presented to Viviani an ultimatum warning that, if Russian mobilisation continued, Germany would attack both France and Russia within the next 12 hours. The ultimatum also demanded that France abrogate at once the alliance with Russia, allow German troops to march into France unopposed and turn over the fortresses in Verdun and Toul to the Germans to be occupied as long as Germany was at war with Russia. In response, the French government ordered its ambassador in St. Petersburg, Maurice Paléologue, to find what was going on in Russia while refusing a request from General Joseph Joffre to order French mobilisation. However, the German ultimatum of 31 July 1914 left the French with two options: either to accept the humiliation of accepting the ultimatum, which would be the effective end of France as an independent nation, or go to war with Germany. The American historian, Leonard Smith, together with the French historians, Annette Becker and Steéphane Audoin-Rouzeau, wrote that France had no option but to go to war as the prospect of accepting Schoen's ultimatum was too humiliating for the vast majority of the French people. After Germany declared war on France following the rejection of the ultimatum, Poincaré appeared before the National Assembly to announce that France was now at war forming the doctrine of the union sacrée in which he announced that: "nothing will break the union sacrée in the face of the enemy." « Dans la guerre qui s'engage, la France […] sera héroïquement défendue par tous ses fils, dont rien ne brisera devant l'ennemi l'union sacrée » ("In the coming war, France will be heroically defended by all its sons, whose sacred union will not break in the face of the enemy"). Poincaré became increasingly sidelined after the accession to power of Georges Clemenceau as Prime Minister in 1917. He believed the Armistice happened too soon and that the French Army should have penetrated far deeper into Germany. At the Paris Peace Conference of 1919, negotiating the Treaty of Versailles, he wanted France to wrest the Rhineland from Germany to put it under Allied military control. Ferdinand Foch urged Poincaré to invoke his powers as laid down in the constitution and take over the negotiations of the treaty due to worries that Clemenceau was not achieving France's aims. He did not, and when the French Cabinet approved of the terms which Clemenceau obtained, Poincaré considered resigning, although again he refrained. In 1920, Poincaré's term as President came to an end, and two years later he returned to office as Prime Minister. Once again, his tenure was noted for its strong anti-German policies. Frustrated at Germany's unwillingness to pay reparations, Poincaré hoped for joint Anglo-French economic sanctions against it in 1922, while opposing military action. In April 1922, Poincare was greatly alarmed by the Treaty of Rapallo, the beginning of a German-Soviet challenge to the international order established by the Treaty of Versailles. He was disturbed that British Prime Minister David Lloyd George did not share the French viewpoint, instead almost welcoming Rapallo as a chance to bring Soviet Russia into the international system. Poincaré came to believe by May 1922 that if Rapallo could not convince the British that Germany was out to undercut the Versailles system by whatever means necessary, then nothing would, in which case France would just have to act alone. Further adding to Poincaré's fears was the worldwide propaganda campaign started in April 1922 blaming France for World War I as a means of disproving Article 231 of the Treaty of Versailles, which would thereby undermine the French claim to reparations. In the German-Soviet propaganda of the 1920s, the July Crisis of 1914 was portrayed as Poincaré-la-guerre (Poincaré's war), in which Poincaré put into action the plans he had allegedly negotiated with Emperor Nicholas II in 1912 for the dismemberment of Germany. The French Communist newspaper L'Humanité ran a front-page cover-story accusing Poincaré and Nicholas II of being the two men who plunged the world into war in 1914. The Poincaré-la-guerre propaganda proved to be very effective in the 1920s, and to a certain extent Poincaré's reputation has still not recovered. Throughout the spring and summer of 1922, the British continued to spurn Poincaré's offers of an alliance with Britain. Poincaré's attempt to compromise with the British on German reparations failed in 1922. By December 1922 Poincaré was faced with British-American-German hostility and saw coal for French steel production and money for reconstructing the devastated industrial areas draining away. Poincaré decided to occupy the Ruhr on 11 January 1923, to extract the reparations himself. This, according to historian Sally Marks, "was profitable and caused neither the German hyperinflation, which began in 1922 and ballooned because of German responses to the Ruhr occupation, nor the franc's 1924 collapse, which arose from French financial practices and the evaporation of reparations." The profits, after Ruhr-Rhineland occupation costs, were nearly 900 million gold marks. During the Ruhr crisis, Poincaré made a failed attempt to establish diplomatic relations with the Soviet Union. Poincaré lost the 1924 French legislative election "more from the franc's collapse and the ensuing taxation than from diplomatic isolation." Hall argues that Poincaré was not a vindictive nationalist. Despite his disagreements with Britain, he desired to preserve the Anglo-French entente. When he ordered the French occupation of the Ruhr valley in 1923, his aims were moderate. He did not try to revive Rhenish separatism. His major goal was the winning of German compliance with the Versailles treaty. Poincaré's inflexible methods and authoritarian personality led to the failure of his diplomacy. Financial crisis brought him back to power in 1926, and he once again became Prime Minister and Finance Minister until his retirement in 1929. As Prime Minister, he enacted a number of franc stabilization policies, retroactively known as the Poincaré Stabilization Law. His popularity as Prime Minister rose considerably following his return to the gold standard, so much so that his party won the April 1928 general election. As early as 1915, Raymond Poincaré introduced a controversial denaturalization law which was applied to naturalized French citizens with "enemy origins" who had continued to maintain their original nationality. Through another law passed in 1927, the government could denaturalize any new citizen who committed acts contrary to French "national interest". Due to his ill health, Poincaré resigned as Prime Minister in July 1929, refusing to serve another term as Prime Minister. He died in Paris on October 15, 1934 at the age of 74. His brother, Lucien Poincaré (1862–1920), a physicist, became inspector-general of public instruction in 1902. He is the author of La Physique moderne (1906) and L'Électricité (1907). Jules Henri Poincaré (1854–1912), an even more distinguished physicist and mathematician, was his first cousin. ^ a b c d Fromkin 2004, p. 80. ^ A letter which Verne later sent to his brother Paul seems to suggest that, though acquitted due to Poincaré's spirited defence, Verne did intend to defame Turpin. ^ Adamthwaite, Anthony Review of Raymond Poincaré by J. F. V. Keiger pages 491-492 from The English Historical Review, Volume 114, Issue 456, April 1999 page 491. ^ a b c d e Fromkin 2004, p. 81. ^ Tomaszewski, Fiona "Pomp, Circumstance, and Realpolitik: The Evolution of the Triple Entente of Russia, Great Britain, and France" pages 362-380 from Jahrbücher für Geschichte Osteuropas, Volume 47, Issue # 3, 1999 pages 369-370. ^ a b Tomaszewski, Fiona "Pomp, Circumstance, and Realpolitik: The Evolution of the Triple Entente of Russia, Great Britain, and France" pages 362-380 from Jahrbücher für Geschichte Osteuropas, Volume 47, Issue # 3, 1999 pages 373-374. ^ Tomaszewski, Fiona "Pomp, Circumstance, and Realpolitik: The Evolution of the Triple Entente of Russia, Great Britain, and France" pages 362-380 from Jahrbücher für Geschichte Osteuropas, Volume 47, Issue # 3, 1999 page 373. ^ a b c d Herwig, Holger & Hamilton, Richard Decisions for War, 1914-1917, Cambridge: Cambridge University Press, 2004 page 114. ^ Fromkin 2004, p. 142-143. ^ a b Fromkin 2004, p. 138. ^ Fromkin 2004, p. 168-169. ^ a b Fromkin 2004, p. 194. ^ a b c Fromkin 2004, p. 233. ^ Fromkin 2004, p. 235. ^ a b Smith, Leonard; Audoin-Rouzeau, Stéphane, & Becker, Annette France and the Great War, 1914–1918, Cambridge: Cambridge University Press, 2003 page 26. ^ Fromkin 2004, p. 235-236. ^ Smith, Leonard; Audoin-Rouzeau, Stéphane, & Becker, Annette France and the Great War, 1914-1918, Cambridge: Cambridge University Press, 2003 page 27. ^ Smith, Leonard; Audoin-Rouzeau, Steéphane, & Becker, Annette France and the Great War, 1914-1918, Cambridge: Cambridge University Press, 2003 page 27. ^ Margaret MacMillan, Peacemakers. The Paris Conference of 1919 and Its Attempt to End War (John Murray, 2003), p. 42. ^ Ernest R. Troughton, It's Happening Again (London: John Gifford, 1944), p. 21. ^ Étienne Mantoux, The Carthaginian Peace, or The Economic Consequences of Mr. Keynes (London: Oxford University Press, 1946), p. 23. ^ Keiger, John Raymond Poincaré, Cambridge: Cambridge University Press, 2002 p. 288. ^ a b Keiger, John Raymond Poincaré, Cambridge: Cambridge University Press, 2002 p. 290. ^ Keiger, John Raymond Poincaré, Cambridge: Cambridge University Press, 2002 p. 291. ^ a b Mombauer 2002, p. 200. ^ Mombauer 2002, p. 94. ^ Ephraim Maisel (1994). The Foreign Office and Foreign Policy, 1919-1926. Sussex Academic Press. pp. 122–23. ^ Keiger, John Raymond Poincaré, Cambridge: Cambridge University Press, 2002 pp. 291–293. ^ Leopold Schwarzschild, World in Trance (London: Hamish Hamilton, 1943), p. 140. ^ Sally Marks, '1918 and After. The Postwar Era', in Gordon Martel (ed. ), The Origins of the Second World War Reconsidered. Second Edition (London: Routledge, 1999), p. 26. ^ Marks, p. 35, n. 57. ^ Hines H. Hall, III, "Poincare and Interwar Foreign Policy: 'L'Oublie de la Diplomatie' in Anglo-French Relations, 1922-1924," Proceedings of the Western Society for French History (1982), Vol. 10, pp. 485–494. ^ Yee, Robert (2018). "The Bank of France and the Gold Dependency: Observations on the Bank's Weekly Balance Sheets and Reserves, 1898-1940" (PDF). Studies in Applied Economics. 128: 11. ^ Makinen, Gail; Woodward, G. Thomas (1989). "A Monetary Interpretation of the Poincaré Stabilization of 1926". Southern Economic Journal. 56 (1): 191. Philippe Bernard; Henri Dubief & Thony Forster (1985). The Decline of the Third Republic, 1914–1938. (Cambridge History of Modern France). Cambridge University Press. Clark, Christopher. The sleepwalkers: How Europe went to war in 1914 (2012). Fromkin, David (2004). Europe's Last Summer: Who Started the Great War in 1914?. New York: Alfred A. Knopf. Adamthwaite, Anthony (April 1999). "Review of Raymond Poincaré by J. F. V. Keiger". The English Historical Review. 114 (456): 491–492. Jean-Marie Mayeur; Madeleine Rebirioux & J. R. Foster (1988). The Third Republic from its Origins to the Great War, 1871–1914. (Cambridge History of Modern France). Cambridge University Press. Maisel, Ephraim (1994). The Foreign Office and Foreign Policy, 1919-1926. Sussex Academic Press. pp. 122–23. Mombauer, Annika (2002). The Origins of the First World War. London: Pearson. Gordon Wright (1967). Raymond Poincaré and the French presidency. New York: Octagon Books. OCLC 405223. Sisley Huddleston (1924). Poincaré: A Biographical Portrait, Little, Brown & Company. This article incorporates text from a publication now in the public domain: Chisholm, Hugh, ed. (1911). "Poincaré, Raymond" . Encyclopædia Britannica (11th ed.). Cambridge University Press. Smith, Leonard; Audoin-Rouzeau, Steéphane; Becker, Annette (2003). France and the Great War, 1914-1918. Cambridge: Cambridge University Press. Wikimedia Commons has media related to Raymond Poincaré. André Pierre Gabriel Amédée Tardieu was three times Prime Minister of France and a dominant figure of French political life in 1929–1932. He was a moderate conservative with a strong intellectual reputation, but became a weak prime minister at the start of the worldwide Great Depression. Joseph-Marie–Auguste Caillaux was a French politician of the Third Republic. He was a leader of the French Radical party and minister of finance, but his progressive views in opposition to the military alienated him from conservative elements. He was accused of corruption, but was cleared by a parliamentary commission. This political weakness strengthened the right wing elements in the radical party. The Chanak Crisis, also called the Chanak Affair and the Chanak Incident, was a war scare in September 1922 between the United Kingdom and Turkey. Chanak refers to Çanakkale, a city at the Anatolian side of the Dardanelles Strait. The crisis was caused by Turkish efforts to push the Greek armies out of Turkey and restore Turkish rule in the Allied occupied territories of Turkey, primarily in Constantinople and Eastern Thrace. Turkish troops marched against British and French positions in the Dardanelles neutral zone. For a time, war between Britain and Turkey seemed possible, but Canada refused to agree as did France and Italy. British public opinion did not want a war. The British military did not either, and the top general on the scene, Sir Charles Harington, refused to relay an ultimatum to the Turks because he counted on a negotiated settlement. The Conservatives in Britain's coalition government refused to follow Liberal Prime Minister David Lloyd George, who with Winston Churchill was calling for war. 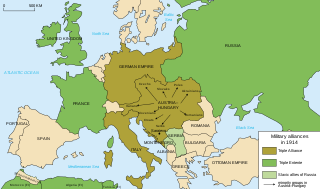 The July Crisis was a series of interrelated diplomatic and military escalations among the major powers of Europe in the summer of 1914 that was the penultimate cause of World War I. The crisis began on June 28, 1914, when Gavrilo Princip, a Bosnian Serb, assassinated Archduke Franz Ferdinand, heir presumptive to the Austro-Hungarian throne. A complex web of alliances, coupled with miscalculations by many leaders that war was in their best interests or that a general war would not occur, resulted in a general outbreak of hostilities among almost every major European nation in early August 1914; every major European nation was involved by May 1915. Jules-Martin Cambon was a French diplomat and brother to Paul Cambon. As the ambassador to Germany (1907–1914) he worked hard to secure a friendly détente. He was frustrated by French leaders such as Raymond Poincaré, who decided Berlin was trying to weaken the Triple Entente of France, Russia and Britain, and was not sincere in seeking peace. The French consensus was that war was inevitable. Gaston Calmette was a French journalist and newspaper editor. Wilhelm Eduard Freiherr von Schoen (Schön) was a German diplomat. He was especially known as German ambassador in Paris at the beginning of World War I and as State Secretary for Foreign Affairs of the German Empire. Auguste Marie Joseph Jean Léon Jaurès, commonly referred to as Jean Jaurès, was a French Socialist leader. Initially a moderate republican, he was later one of the first social democrats, becoming the leader, in 1902, of the French Socialist Party, which opposed Jules Guesde's revolutionary Socialist Party of France. The two parties merged in 1905 in the French Section of the Workers' International (SFIO). An antimilitarist, Jaurès was assassinated at the outbreak of World War I, and remains one of the main historical figures of the French Left. Jean-Jacques Becker is a French historian, born 14 May 1928 in Paris. He is a specialist of contemporary history. Henriette Poincaré was the wife of French statesman Raymond Poincaré. She was born in Passy, France. Her parents were a coachman of Italian origin, Raphael Benucci, and Louise Mossbauer, a young servant. She served for a time as a companion to old ladies of the bourgeoisie. The Black Sea Raid was an Ottoman naval sortie against Russian ports in the Black Sea on 29 October 1914, supported by Germany, that led to the Ottoman entry into World War I. The attack was conceived by Ottoman War Minister Enver Pasha, German Admiral Wilhelm Souchon and the German foreign ministry.